Are you on Facebook? Show your support by joining our Facebook group. Take action and make your voice heard on enhancing the economic viability and quality of life of our community and region by supporting high speed passenger rail through Rochester. If your business or organization supports Alliance's principles and you want to make your voice heard about high speed passenger rail options in Minnesota, contact Tim Geisler at 507-284-5752 or via email at info@SEMNrail.org. If you are an individual interested in routing high speed rail between Chicago and Minneapolis/St. Paul along a Rochester corridor, sign up for our email updates. We’ll keep you connected with the latest news and provide you with details about how you can continue to make a difference that will impact the region for years to come. Learn more. 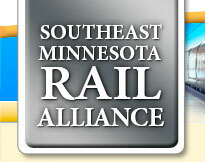 Tell friends and family about the Southeast Minnesota Rail Alliance and spread the word about the importance of a Rochester Corridor for high-speed train travel between Chicago and Minneapolis/St. Paul. Learn more.